Bank of America offers merchant account credit card processing services for your business transaction needs. Being a merchant account provider allows Bank of America to offer processing solutions for anything from ecommerce website sales to large corporate functionality. They offer terminal and card processing equipment options and have a competitive package on rates and rebates for either purchase or rental of your point of sale terminal equipment. Currently Bank of American is offering merchant account fee matching for new applications and with such a wide selection of offerings for your retail payment processing needs there is sure to be a product that is appealing no matter what your business is. 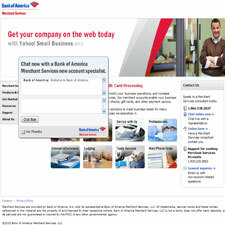 Bank of America currently does not accept high risk credit card processing products with their merchant accounts.